恭喜发财~! 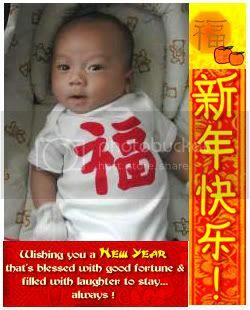 - A mummy's inane blabberings..
this is still my fave cny pic of the li' one @1 1/2 mths old :) I only have this low resolution pic as my ex-pc crashed with most of Aidan's baby pics (thankfully I have hard copies)..
Wishing all a Happy Lunar New Year!! Feel free to send Aidan 红包s!! eh..don't think so lah. Aunty here too old to procreate liao! oi! Proposed liao can give already lah.Can practise first mah! ooh..ur twins have grown so much! they were mere babes not so long ago. They look so different now! Cant believe how fast the year has passed.! not coming back to S'pore anytime soon? Looking forward to see Aidan's 2010 pics. The piggy must so smelly with his drool! Didn't recognise Aidan for a moment....he has grown so much! heh, u didnt write ur name so i dont know who you are. Happy New Year to u! hehehe....I've 3 to collect from you this year LOL! jialak..i loogi man. And u got 3 somemore!! Happy Lunar New Year. Wan wan ! heh..HNY to u too! We;re gonna meet up at Macy's bday ah! KONG HEY FATT CHOY TO YOU AND YOUR FAMILY! & to u too! keep ur spirits up eh! that sure brings back memories of the kids when they were tiny babies...baby Aidan is so cute!! is piggy still his favourite? wish you and your family a happy and prosperous CNY!! yeah..piggy is still his fave! He has to sleep with it everyday! our boys have all grown so much..though i think caleb hasn't changed much in looks! !